In what will come across as a really shocking development, a man has ended up getting crushed to death by his mother's coffin during her burial. An Indonesian man was killed when his mother's coffin fell from a funeral tower and crushed him during a service on the island of Sulawesi. Samen Kondorura, 40, died when pallbearers lost their footing carrying the coffin up a bamboo ladder in the Parinding valley in North Toraja district. The casket fell as the group hoisted it onto a lakkian - an ornately carved tower where the dead are placed before elaborate traditional funeral rites. 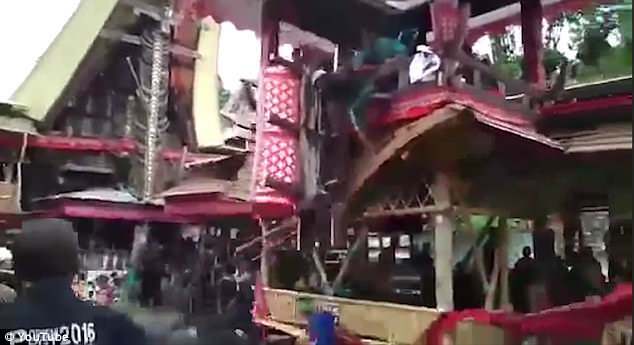 'As the mother's coffin was being raised to the lakkian, suddenly the ladder shifted and collapsed, the coffin fell and hit the victim,' Julianto Sirait, chief commissioner of the Tana Toraja resort police, told AFP. Graphic video from the scene shows the ladder slip just as the casket enters the tower, sending the men tumbling several metres to the ground where the victim is crushed by the coffin. Horrified onlookers rush to the men's aid but Kondorura died later in hospital. When ethnic Torajans die, local residents hold elaborate funerals that can last for days and involve music, dance and the sacrifice of water buffalo.